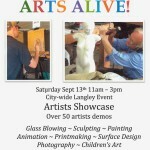 A showcase of artists will be offered in the first annual “Arts Alive” event on Saturday, Sept. 13th from 11am to 3 pm. This city wide street event will bring together local artists demonstrating their talents and providing education in their respective artistic categories. Many of the participants are regionally, nationally and globally recognized local artists. The day will feature educational demonstrations on techniques by glass blowers, sculptors, painters, animators, sketchers, surface designers, print makers and photographers. With chisels, hammers and hands, ten sculptors will demonstrate a variety of mediums from stone, clay and wood to the creation of soap bubble streaming by Tom Lindsay. 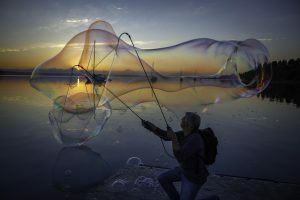 Known for his work in creating interactive water exhibits at children’s museums, Lindsay is now experimenting with bubbles, which will provide an interesting contrast between creating bubbles and forming stone. Visitors will have the opportunity to try their hand at making their own creations in stone, wood, clay and bubbles. *Tom Lindsay will do a special “sunrise” session making bubbles as an introduction to ‘Arts Alive’ on Sept. 13 at 6:30 a.m. at the Langley Harbor. 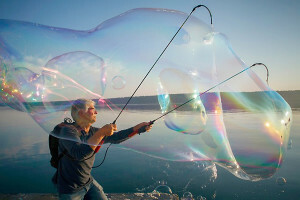 Throughout the day he’ll be making more bubbles, weather permitting, at Seawall Park. Dip a brush and join over twelve artists in painting and drawing from live models and still life undercover in ‘plein-air’ on Second Street. Artists, including, Faye and Truman Castle, Phyllis Ray, Cary Jurriaans and Toby Hall and many more, will depict an accurate and truthful representation of a subject matter in their own unique style. Other artists are invited to join. Weave your own design as surface artists demonstrate coloring, patterning and structuring of fiber and fabric. Ilene Sorenson will demonstrate kumihimo, a Japanese braiding art, on a freestanding braiding loom. There will be small handheld looms available for people to try this technique. Patti King will show Korean-style pieced work, known as bojagi. Janet King and Fine Gelfand will demonstrate unique felted fabrics and structures and drawing and painting on fabrics using Shivaa Oil paint sticks. If fire is your attraction watch Callahan McVay lead a team of glass blowers at his studio, Callahan’s Firehouse on Second Street. Watch as starfish and flowers come to shape from fire and silica, or you can blow your own glass art. Next to the Brackenwood Gallery on First Street will be multi-faceted art demonstrations. Skip Smith will show how to make an old fashioned tin-type, including darkroom demonstrations. Francy Blumhagen will demonstrate her collage techniques and Buffy Cribbs will do printmaking on a copper plate printer. Buffy will also demonstrate how to do reverse painting on plexiglass. David Welton will do a photojournalism workshop to document the event. Leonard Good will have a solar/Cyano print tutorial. Kim Tinuviel will deomonstrate photo-encaustic, a new synthesis of an ancient encaustic painting techniques and modern photography. Amanda Moore and Drew Christi will illustrate animation. Their work includes short films, music videos, commercials, cartoons, books, and relief prints featured in such prestigious publications like the New York Times, The Huffington post, The Atlantic, Seattle Magazine and more. Children are welcome to join Melissa Koch in creating a giant butterfly mural on the wall at US Bank on Second Street. The giant butterfly will be made from individual butterflies that children will create from muslin and paint. Once joined together the butterfly will be hung from two bamboo columns creating an ephemeral curtain. Organizers, Colin Campbell and Rene Neff are thrilled to help facilitate and launch “Arts Alive” to showcase the incredible variety and quality of island artists. The event is sponsored by the City Of Langley, Chamber of Commerce and Langley Main Street Association.